One of the great strengths of EMF is its reflective API and the fact that you can dynamically create models and instances of it without generating any code. Dynamic EMF is really powerful but there are some limitations and common pitfalls. For one, you should be careful when mixing dynamic and static models. Another thing to be careful about is that once you've defined a dynamic EMF model and you have created instances of it, you should beware of making any (structural) changes to the model because there is a good chance that it will invalidate your instances and maybe even cause run-time exceptions. Changing the model while working with instances of it seems to be something that you would not really do in practice, but there are actually applications where this is useful and desirable, e.g. metamodel evolution and instance model migration. 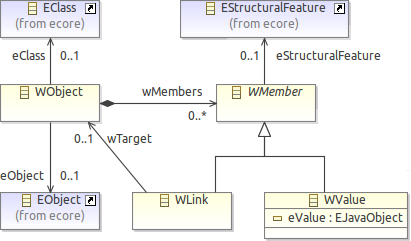 A WObject wraps an EObject, WLinks represent instances of EReferences, and WValues specific data values. The default implementation of the wrappers propagates all consistent changes to the wrappers or the metamodel down to the EObjects. Using this model in Henshin allows us to define dynamically typed transformation rules. Let's have a look at the following two example rules. The first one is an ordinary (statically typed) rule which matches an object a of type A such that the name attribute of a is x and creates an object b of type B and a link of type ref from a to b. The second rule is semantically equivalent, but here we use wrappers. The top row matches the metamodel elements, i.e. two EClasses named "A" and "B", an EReference named "ref" and an EAttribute named "att". 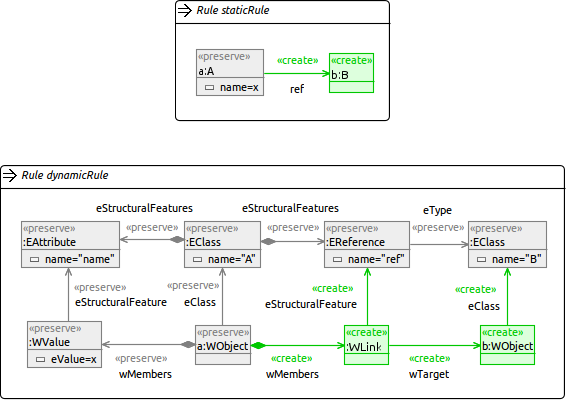 The lower part represents the instances of these metamodel elements (modeled using wrappers). This rule deletes the ref-EReference from the metamodel. 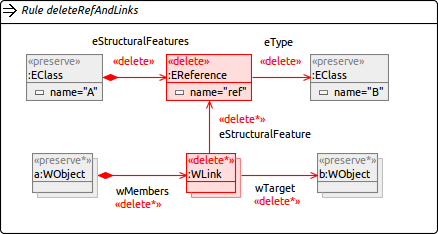 In addition, all links of this type are removed from all instance models. The deletion of all links is realized using the *-operator (multi-rules in Henshin). Note that we did not connect the wrapper objects with the EClasses using type-references because we also want to handle instances of subclasses of A and B. This is only a small example, but I think it already shows the potential of the approach. We have described this approach and its use for defining coupled metamodel and instance model evolution in a paper accepted for ICMT 2013. The wrapper model is shipped with the current release of Henshin (0.9.6) together with two examples: one for copying arbitrary EMF models and one on coupled evolution.